As if the endless promotional material didn’t already have us busy, the incessant Mathematical Lords of All Cinema and their early tracking numbers have been keeping us on our Giant Freakin’ toes when it comes to Pacific Rim‘s potential box office numbers. The general consensus is that it might earn a low percentage of its monster-sized budget. (I’m sick of the word “flop” at this point.) Just two days ago, Variety pegged the film’s weekend gross ranging between $25-$35 million, making it comparable to the disastrous opening that Gore Verbinski’s The Lone Ranger had last weekend. Meanwhile, Adam Sandler and Co. are poised to make something just over $40 million with the deer urine-soaked Grown Ups 2. You guys know this means we’d have to change from a sci-fi site to one that one only covers “white guys who used to be funny, and Chris Rock,” right? This Friday, audiences across the country will be dazzled and thrilled by the latest film from Mexican director Guillermo del Toro, Pacific Rim. 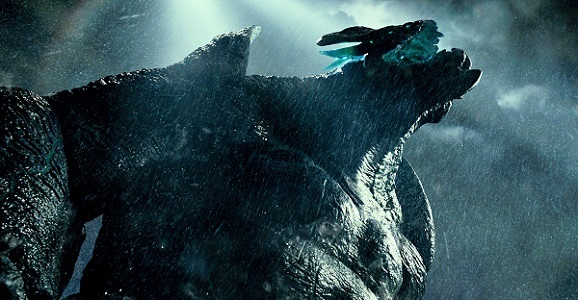 Whether or not you believe the film’s current tracking with general audiences, the giant monster movie will either sink or swim in theaters this weekend. Hopefully, it will be the latter. To make sure Pacific Rim will perform at its best with general audiences, Warner Bros. has been making a final promotional push with the new film, so the public will be fully aware that this movie is just too big to ignore. Mirroring the film’s epic scale, Warner Bros. has released a super-sized, 14-minute featurette that examines almost every facet of Pacific Rim. 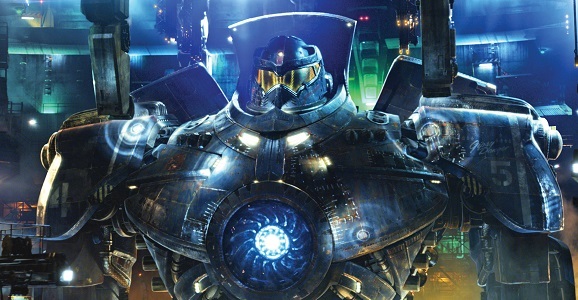 Pacific Rim Gets Praise From The Hollywood Reporter, Neil Gaiman, And…Kanye West? Pacific Rim may not end up being the best film of all time, and I’m fine with that. But I’m certainly ready for it to be the best flick of the summer, superheroes and Star Trek Into Darkness be damned! And I’m not basing it only on the really positive buzz the film got after an early screening some months back. No, this time, I’m putting my trust in Kanye West, who until this point was only a source of trust when it came to how much black people are buying into commercialism, and how he’s really just God in disguise. He took to Twitter last week, breaking critic embargoes by saying, “I saw a pre-screening of Pacific Rim yesterday and it’s easily one of my favorite movies of all times.” He expanded that opinion with, “This is not another ‘Robot’ movie. Guillermo del Toro is a master.” I’ll be the first to admit I have no idea what West’s everyday movie tastes run to, nor what other “robot” movies he’s talking about. As you can imagine, these tweets got major attention, and even attracted a response from Pacific Rim star Ron Perlman, who told West, “Need Kaiju parts, u get the fam discount!” There’s a high five waiting to happen here. 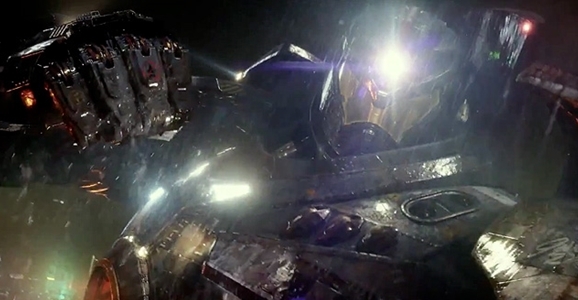 Remember that “final” Pacific Rim trailer from the other day? Turns out the finality of that video may have been overstated at the time. Why would we say that, you ask? Because just a few days before the July 12 release date, we’ve got yet another new preview on our hands. None of us should be particularly surprised by this turn of events. At this point Warner Bros. and Legendary have produced so much marketing for Guillermo del Toro’s epic giant monsters versus giant robots adventure, that it has probably become second nature. Maybe they can’t stop, like an addiction, and we should stage an intervention. Seriously, they have a problem, there are also three new TV spots. This latest trailer paints the human race not as an army, but as resistance, as freedom fighters staving off an oppressor. The implication is that the Kaiju, the massive creatures that emerge from an interdimensional rift on the ocean floor, are an occupying army. In some ways that seems like an apt comparisons, but not so much in others. Their presence, size, and destructive capabilities certainly make them a force to be reckoned with, and compels people to focus on the invasion—by doing things like creating Jaegers, skyscraper sized mechs to fight the monsters. But they’re more of a devastating natural occurrence than an invading military force. You get a sense of nature run amok. Then again, I’m probably reading too much into a two-minute trailer for a movie about robots punching monsters. Why should you be excited for Pacific Rim? Why wouldn’t you be? It’s directed by Guillermo del Toro for one, a genre heavy-hitter who has so far done damn near no wrong. It’s got a badass premise that finds a desperate humanity constructing massive battle mechs — Jaegers — to combat enormous monsters — Kaiju — emerging from a dimensional rift on the bottom of the Pacific. It’s got a cast that includes Sons of Anarchy’s Charlie Hunnam, Idris Elba as the awesomely named Stacker Pentecost, and del Toro regular Ron Perlman as a dealer in Kaiju organs, with creature design by the legendary Wayne Barlowe. It’s also written by up-and-comer Travis Beacham, the dude who wrote the in-freaking-credible — but still unproduced — spec script A Killing on Carnival Row. At this point it feels like we’re going to continue seeing new marketing for Pacific Rim long after the movie has come and gone, maybe forever. It’s like an endless parade of promotion from Warner Bros. and Legendary Pictures. But somehow, someway, I’m still not sick of it. Slap the words Pacific Rim on a video of paint drying and I’ll watch it. Don’t get me wrong, I’m a little excited for the deluge to go away when Guillermo del Toro’s monsters versus robots epic finally opens next Friday, July 12, but not nearly as excited as I am to see the actual movie. Watching this latest behind the scenes feature that delves into every aspect of the Kaiju, the giant monsters in the movie, gets me that much more pumped. This video from Warner UK is nothing but people involved with Pacific Rim talking about their monsters. And yes, they all look like enthusiastic children getting to live out a prepubescent dream. Listening to del Toro talk about his love of old Japanese kaiju films—kaiju in Japanese translates to monster, and is the name given to the old, guys-in-rubber-suits style monster movies—is infectious. You get the impression that he wanted nothing more out of Pacific Rim than to make a movie he would have loved as a kid. He even says this movie speaks to his inner child like nothing else he’s ever made.